What is the Right Marketing Technology for your Lead Generation Campaign? 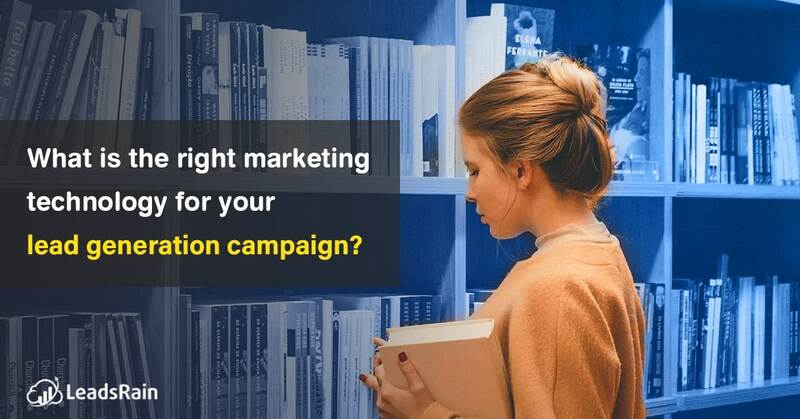 If you are pursuing a direct marketing method for your campaign, this question is probably haunting you right now. So let’s get you some closure on that. Here, we will discuss what the right choice is for your campaign, keeping some simple aspects in mind about your data, your audience, and your end goal. Since this information is the foundation of your campaign, it is important to get a clear idea about them, before proceeding to the next step. When looking at direct marketing, clients often opt for services allowing verbal communication. Now we don’t see any problem with that because research is in favor of verbal communication at 2 important phases of the marketing funnel. Initially, the cold leads, who are learning to understand the product, and for the hot leads, when they are being closed. Here we will be talking about two of our services, the Ringless Voicemail, and the Cloud-Based Auto Dialer. Both have a unique role to play in a campaign, and here we will be guiding you on how to choose the right one for you. Firstly, to distinguish between the two services, one is a phone call, and another, not quite. Ringless voicemail is a stand-out technology that solves a number of problems for those pursuing calling their clients. So what makes one a better choice over the other? Let us start that discussion here. It is a crucial practice to understand your leads, just how it is important for a teacher to understand their class. How are you going to approach them if you do not know who they are and what they like about your product? Assuming that you have the data for your lead generation campaign, you must have information on who these leads are, and how deeply interested are they in your product, before you choose to take any of the services. Analyzing your leads is a healthy practice to achieve a better result from your marketing campaigns. During the process of analyzing your leads, you will come across mainly two categories of leads: Hot leads and Cold Leads. Now that you have categorized them, you have a better judgment on their requirements, and with it, the approach. Now let us move on the stages of a marketing funnel and based on the data you have, where you really stand. You could be using the direct marketing services for a number of end goals, from generating more data where you find out more about your existing leads, to spreading awareness about your product. You could even be using the services to send alerts about recurring payments or a new product or, on your hot leads to finally close them. It all depends on your existing data. If you wish to act on your cold leads, it is advised that you gather more information on them. This process would filter the ones who have accidentally entered your database. While this might seem disappointing, you will have a better chance of closing the existing lot. If your focus is the hot leads, you need to act upon them immediately. Delaying any further will only make you lose your opportunity to close them. With the leads interested in your product, you need to connect with them on a personal level for them to purchase the product immediately. Hot leads need a lot of attention and care for them to convert to customers. As mentioned earlier, both these services have a particular role to play in a marketing funnel and cannot be placed at any random stage. So what will it be for you? The RVM or the cloud-based predictive dialer? Here is what the ringless voicemail has to offer for you. It is a great conversation starter. Using this technology, you can drop a voicemail directly into their voicemail box without ringing the phone. This service is appreciated by the customers because it focuses on their comfort before the company’s message. The RVM is sure to get a huge listening rate. The recipients can access it when they find the time and can take action towards your message, bringing them deeper into the lead funnel. So if your campaign is focusing on generating data, or sending a notification, the voicemail drop service is the right choice. The cloud-based predictive dialer is for a much-advanced stage, where you are looking to close your hot leads immediately. The service allows you to connect with your leads over a phone call. This sales dialer can identify human voice from a machine and it will connect only the humans to your agents for further communications. You can drop a pre-recorded message to the answering machine that you have reached so they can get back to you in case they need to purchase the product. This function comes in the inbound-outbound dialer option. A sales dialer is the best option for closing your hot leads because it comes with a number of features that make your rainmakers highly efficient during the campaign. Features such as lead review, call recording, callback feature make your sales team powerful closers. These features let the sales executives study their performance and evaluate themselves after the day. They can also note any particular observation about the lead to help target him better. With the callback feature, the agent will be reminded about the scheduled callback so they can stay punctual. With such observable differences, a client must make sure that they are using the right services to be able to get the best results during the campaign. So what is your choice of direct marketing service?